Puzzle Me! is a game that can be enjoyed by anyone 6 years old and up. Build the biggest puzzle you can, but watch out for Karma! 299 backers pledged $6,501 to help bring this project to life. Puzzle Me! 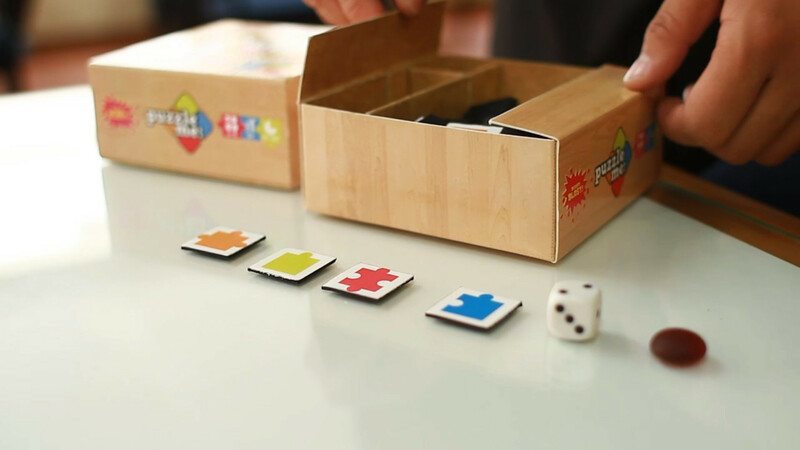 is a family-friendly board game packaged inside a cute, little box. In Puzzle Me!, players connect jigsaw puzzle-shaped pieces to build the biggest puzzle they can. During each player’s turn, they may either place a puzzle piece into their own puzzle, or they may choose to place a piece into an opponent’s puzzle to try and block that opponent’s expansion. But be careful! Making a play like this may lead to similar payback in the near future. It’s Karma! Puzzle Me! was created by Brainstormers - that's us! 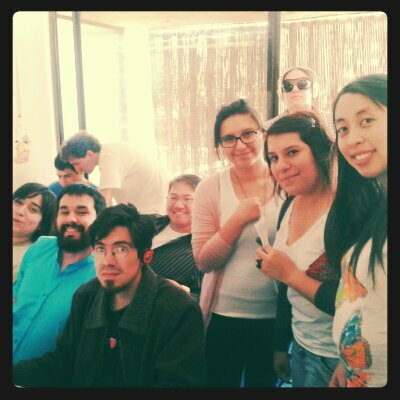 We’re a new game studio located in Santiago, Chile, and we develop both board games and video games. Our motto is “Fun Games from Happy People”. Our humble, little company is comprised of passionate gamers, creative thinkers, skilled artists, talented designers, proud Chileans, and one dude from America (otherwise known as Richard Reyes, the guy doing all the talking in the video). WHY DO WE THINK PUZZLE ME! IS AWESOME? We wanted to make a game that can be enjoyed by anyone. Kids can have fun playing Puzzle Me!, and so can adults. Families can play Puzzle Me! together. The game was designed to be easy-to-learn & quick-to-play, yet there is enough strategy and luck involved to make every new game a little different than the last. Puzzle Me! is the very first board game created by the Brainstormers team, and many of us have contributed to its creation. Puzzle Me! was designed by Pablo Gorigoitía, one of Brainstormers’ founders, master talkers, and an all-around nice guy. The game’s logo, box, and overall brand were designed by Javiera Pradenas, Brainstormers’ super-talented Lead Graphic Designer. Many of the Brainstormers contributed to the game by playtesting it, refining the rules, writing the instructions, and putting this Kickstarter campaign together. Yay, team! 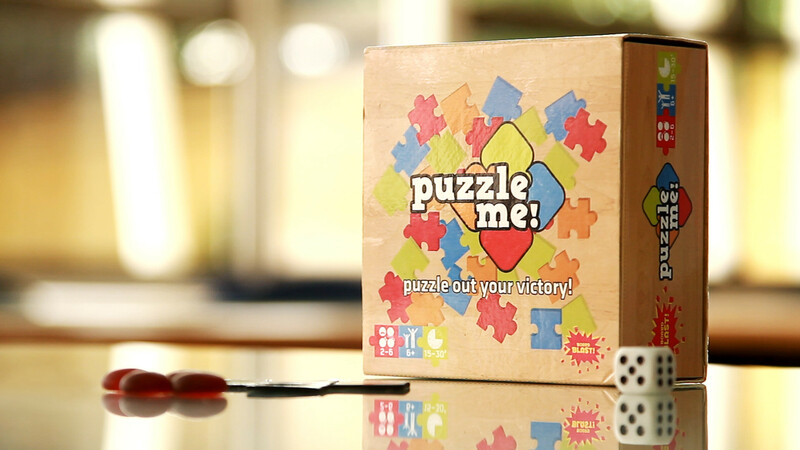 By supporting Puzzle Me!, you’ll be supporting our entire team's dream of making fun games that bring people together. Money pledged by YOU and other, equally awesome people will be used for printing & distributing copies of the game, as well as for trademarks & copyrights. Any funds raised in excess of our original goal will be used for the printing of additional copies, trade show exhibitions, and marketing materials. Please visit our website – www.brainstormers.cl – for more information about Brainstormers, Puzzle Me!, and the other projects we are working on. Or you can visit the site just to marvel at our talented team’s art! A little info about Octavio: Octavio is the true mastermind behind Brainstormers. In addition to being a visionary and a shadowy overlord, he’s also adorable, so he doubles as our company’s mascot. By pledging $1, you will have the gratitude of each Brainstormer. Every bit helps, and we thank you for it! Estimated delivery: Gratitude is instantaneous! We have 5 different pin designs that feature cool things like the Brainstormers logo and Octavio - our company's Mascot and Adorable Overlord. Those who pledge $5 or more will receive a package with 3 assorted pins. US shipping included; for international orders, please add $5 for shipping. One (1) copy of Puzzle Me! Enjoy the game that YOU helped to make! PLUS! 4 assorted Brainstormers pins! US shipping included. For international orders, please add $10 for shipping. TWO (2) copies of Puzzle Me! Enjoy the game that YOU helped to make, and give a copy to a friend, family member, or someone else you care about. PLUS! A complete set of 5 Brainstormers pins! US shipping included. For international orders, please add $15 for shipping. FOUR (4) copies of Puzzle Me! Everyone you know should be playing the game. PLUS! A personalized “thank you” addressed to you will be posted on Brainstormers’ Twitter feed and Facebook page. US shipping included. For international orders, please add $20 for shipping. FIVE (5) copies of Puzzle Me! PLUS! A personalized “thank you” addressed to you will be posted on Brainstormers’ Twitter feed and Facebook page. PLUS! Your very own CARTOON PORTRAIT, which will be drawn by one of our talented artists! The cartoon portrait will be sent to you digitally in a file format of your choosing - JPG, PNG, PSD...you decide! US Shipping included. For international orders, please add $25. Get everything in the “Ding! You’re level 100!” $100 level. PLUS! You will be acknowledged as a “Brainstormers Hero”, and your name will be printed in the instructions sheet and on the official Puzzle Me! website. “We’re Going to Need a Bigger boat.” Fifty (50) copies of Puzzle Me! This reward is intended for store owners / managers who wish to stock their shelves with our game. PLUS! Your store logo will be shown on the Brainstormers / Puzzle Me! webpage. US shipping included! For international orders, please add $50 for shipping. PLUS! “Possible Pancakes & Puzzles”: Richard of Brainstormers will treat you to dinner at a mutually agreed upon restaurant (that must be located in the greater Southern California area) and even play Puzzle Me! with you! PLUS! 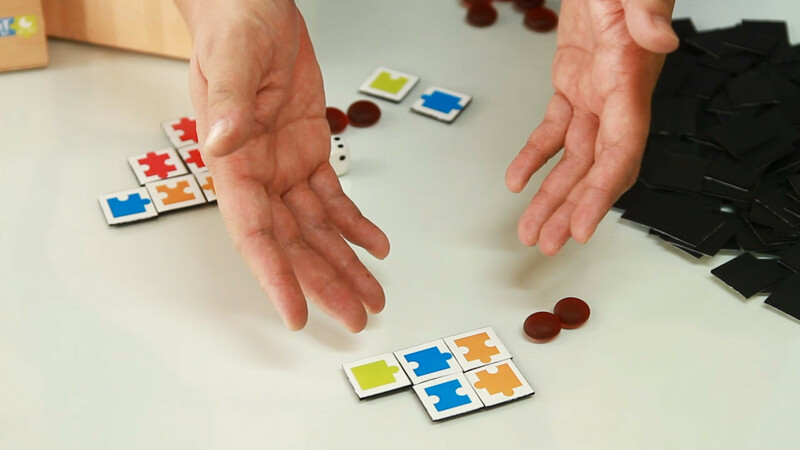 Possible Pancakes & Puzzles: Richard Reyes of Brainstormers will treat you to dinner at a mutually agreed upon restaurant (that must be located in the greater Southern California area) and even play Puzzle Me! with you! Brainstormers will declare a company holiday in your honor, the date of which will coincide with the date that you made your pledge. Throughout the end of time, that day of the year will be celebrated by a leisure day and company BBQ. We will make a toast to your name, your generosity, and your glory. Pictures and video of the event will be posted in history records (otherwise known as the Internet).